OC Elite offers both Recreational & Competitive cheer teams. We have teams and classes to meet everyones budget and time commitment needs. Our practices are held indoors in a state of the art cheer gymnasium with both a spring floor and non spring floor, as well as training equipment, 40 ft air track & 30 ft tumble track trampoline. If you are interested in trying out for one of our year round competitive cheer teams, please see the information below. *$15 Tryout clinic fee – Tryouts consist of a dance, cheer, and jumps. -If you are unable to make Cheer Tryouts, call now for a private evaluation! Please select the “TNT and Rec Program” packet for our low cost competitive recreation program, or “Elite Competitive Program” packet for our more competitive cheer teams which include tumbling. Everyone makes a team! No experience is required, Beg-Adv levels. Download a tryout packet below. Please like our Facebook page to stay up to date on upcoming events, and our Instagram to see the latest photos. 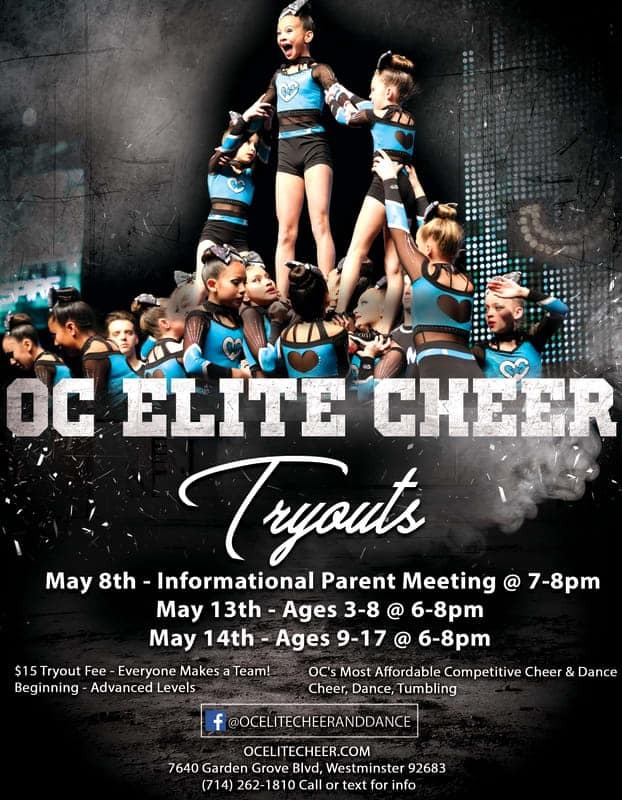 OC Elite Cheer & Dance is a competitive cheer program for ages 4-18. All OC Elite athletes will experience individual growth and team unity. They will also learn the importance of dedication to a team, self-confidence, self-motivation, and perseverance. The coaches are THE BEST!